The classification of trajectory data is required in a wide variety of movement tracking experiments. Automatic classification using machine learning techniques has the potential to greatly increase efficiency and reliability of these studies. Here, we apply supervised classification algorithms on a dataset obtained through a kickboxing experiment to classify the limb and technique that was used for each strike as well as the expertise of the person performing the strike. Beginner and expert kickboxers were asked to strike a boxing bag from several distances, producing a dataset of approximately 4000 strike trajectories. These trajectories were classified using the K-nearest neighbours (KNN) and multi-class linear support vector classification (SVC). We show that both of these algorithms are capable of correctly classifying the limb used for the strike with \(\sim \)99% prediction accuracy. 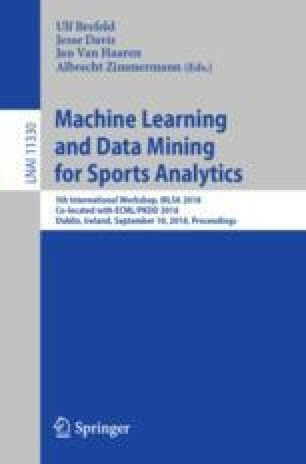 Both algorithms could classify the techniques used with \(\sim \)86% accuracy. The accuracy of technique classification was improved even further by applying hierarchical classification, classifying techniques separately for each limb. Only 10% of the dataset was required as training set to approach the observed prediction accuracy. Finally, KNN was capable of classifying the strikes by skill level with 73.3% accuracy. These findings demonstrate the potential of using supervised classification on complex limb trajectory datasets. This project received the support of the Nederlandse Organisatie voor Wetenschappelijk Onderzoek (NWO), reference number: 464-15-130.